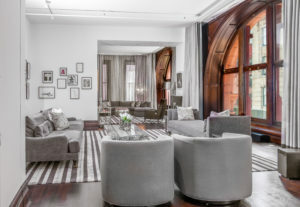 STUNNING DESIGNER LOFT As you approach the ornate sandstone and brick facade of Bleecker Tower with its iconic copper tower, it is already apparent that that this building is anything but ordinary. Built in the late 19th Century to house the Manhattan Savings Institution, this magnificent, monumental building was the site of one of the greatest bank heists of all time by George Leslie, the “King of the Bank Robbers?” and his band of thieves, solidifying a place in NYC lore. Today, this legendary building has been transformed into a boutique and exclusive cooperative in the heart of NoHo with apartments that echo the grandeur of the building itself. 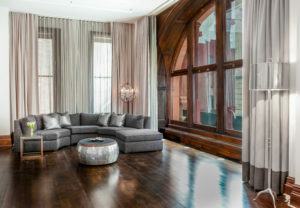 Apartment 2E is perhaps the crown jewel of the building, benefitting from the dramatic, floor-to-ceiling arched windows that encircle the building’s 2nd floor with approximately 12 ½ -foot ceilings. 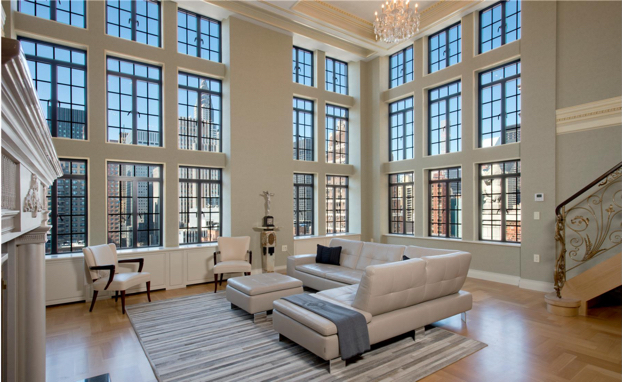 The colossal scale of the windows emphasizes the expanse of the loft space while simultaneously articulating the vast living room into more intimate areas with no shortage of uses. 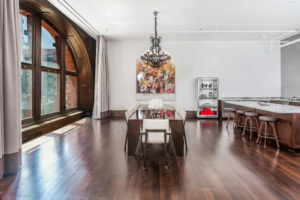 With an incredible, open chef’s kitchen featuring top of the line stainless steel appliances, including 2 ovens, 2 Fisher & Paykel dishwashers, 2 refrigerators as well as a wine refrigerator, this is a home designed for entertainment and has the capacity to cater elegant dinner or cocktail parties on an impressive scale. The hardwood cabinetry, gorgeous marble counters and center island, as well as the sophisticated finishes make this the perfect blend of beauty and functionality. The serene master suite showcases a custom dressing room and magnificent, sparkling master bath with radiant heat marble floors, elegant Maestro Picasso soaking tub, decorative wrought iron staircase, standing shower with exquisite mosaic tile and Dorn Bracht fixtures, and La Cava double vanity. A handsome library lined with bookshelves also features an adjoining media room and is adjacent to a fully renovated 2nd full bathroom. Complete with automated Lutron lighting and muti-zoned Sonos surround sound, new luxurious hardwood floors throughout, this trophy home also includes a powder room and washer/dryer. This stunning home was reimagined by award-winning interior designer, Nina Serafi. Bleecker Tower features a part-time doorman, beautiful landscaped roofdeck and private storage bins. 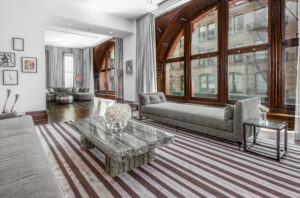 Located in the heart of NoHo, enjoy fine dining at Balthazar, BondST and Mercer Kitchen, as well as all neighborhood amenities, including Equinox, Soul Cycle, The Bowery Hotel, Crosby Street Hotel, designer shopping and so much more.